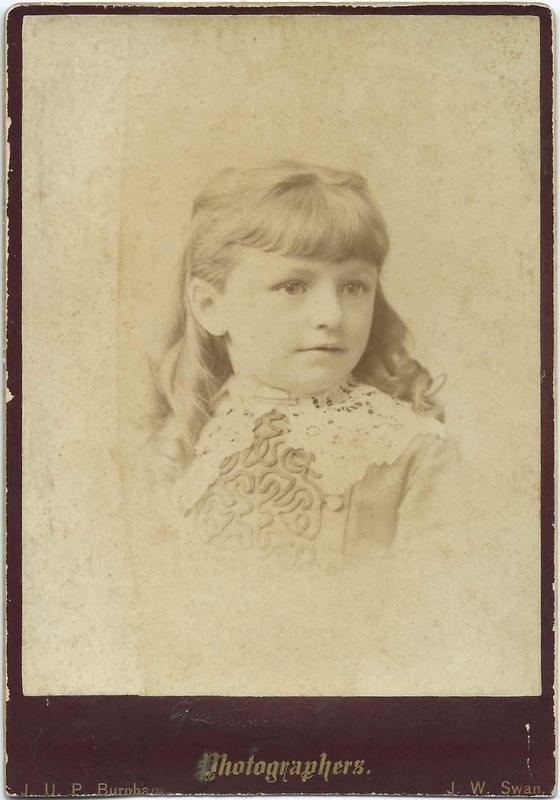 Cabinet photograph of a young girl identified on the reverse as Gertrude Jones Greene. 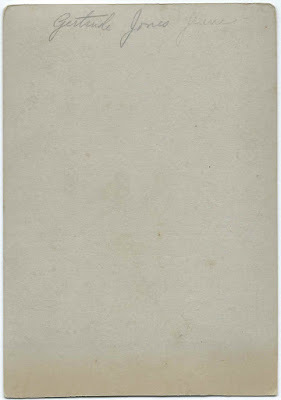 The photograph was taken by the studio of J. U. P. Burnham and J. W. Swan at Norway, Maine. Gertrude was presumably Ruth Gertrude Jones, who would marry Edward Leon Greene. 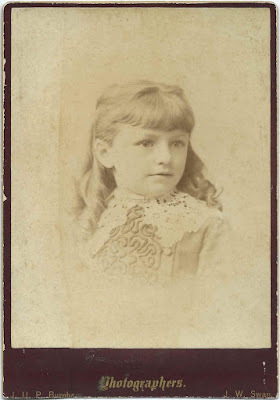 Ruth Gertrude Jones was born June 2, 1878 at Bangor, Maine, the daughter of Alphonso Clarence Jones and Abbie Ella (Knight) Jones. The family would soon move from Bangor to South Paris, Maine. Gertrude's birth record gives her name as Gertrude Jones; her marriage record gives her name as Ruth Gertrude Jones. While researching Gertrude, I happened upon an amazing homage: the "Courting Correspondence of Edward Leon Greene and Ruth Gertrude Jones". Not only does the collection feature many of their letters but also a family history and photographs of Edward at age 21 and Gertrude at age 17. Gertrude and Edward Leon Greene married June 5, 1901 at South Paris, Maine in the "Haskell House". Edward was born August 1, 1876 at North Waterford, Maine, the son of George Frye Greene and Deborah, or Dora, Blanchard (Rideout) Greene. 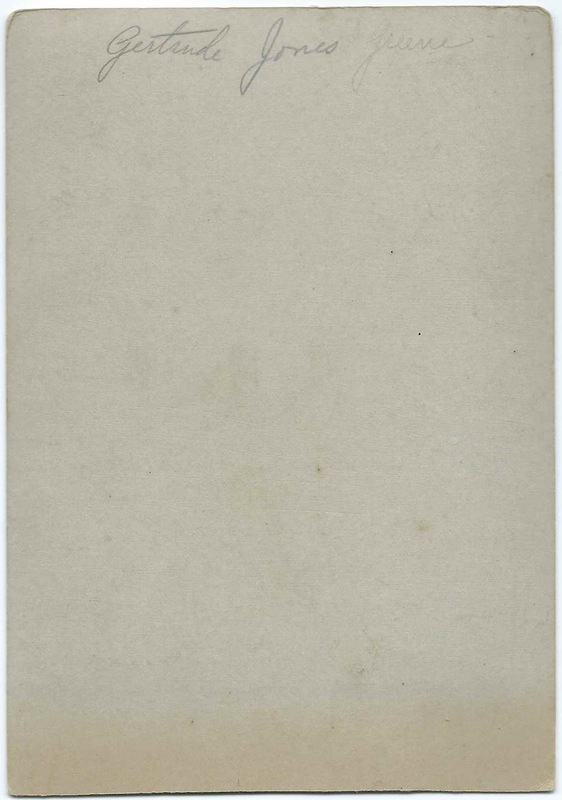 At the time of their marriage, Gertrude was a teacher and Edward a decorator. Gertrude and Edward would have, I believe, three children. Edward died in 1958 and Gertrude in 1968. They're buried in the Riverside Cemetery at South Paris, Maine.